Today I cover the responses we received to Friday’s question—238 valid ones in all, the lowest response rate of the week (hey, it was a Friday). On the other hand, the question also generated more humorous replies than any other. Some of the most entertaining suggestions include a flamethrower, a phaser, a laser-beam weapon that auto-targets BlackBerrys, a Silly String sprayer, a pregnancy tester, and an accessory for physically accosting the user that could be activated remotely. We also received a few ideas that, while scoring points for imagination, seem unlikely to be implemented in the next few years; for example, a direct link to your brain, and an accessory that lets the iPhone drive your car using a built-in navigation app. We again picked a random respondent to receive a thank-you gift. 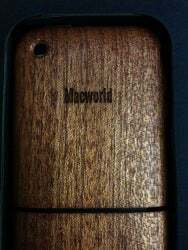 Friday's schwag was a custom-made, Macworld-logo, iWood iPhone 3G case from Miniot. The recipient is @tdub1974, whose #1 hardware improvement would be a front-facing camera for video conferencing. Keyboards and cameras, oh, my! Input Devices: A whopping 57 respondents specifically mentioned an external keyboard of some sort for typing longer documents on the go; 11 others are still holding out—in vain, I suspect—for a physical keyboard on the iPhone itself. Other input-device requests include a game controller (8 requests), health meters (heart rate, blood pressure, blood sugar, temperature, etc. ; 4), a signature pad (1), and a business-card scanner (1). Camera Improvements: Want a front-facing camera? So do 38 of our respondents, and 21 more want a flash or LED light for the existing camera; the other responses were an “improved” camera (8), an accessory for downloading photos from a digital camera to the iPhone’s internal storage (2), a tripod mount or a case with a tripod mount (2), a camera mirror (1), and a zoom lens (1). Audio/Video: A built-in FM transmitter was the biggest vote-getter, with five requests, followed closely by a better/louder built-in speaker (4), Bluetooth headphones included (2), an FM tuner (2), an HD Radio tuner (2), a VGA/USB “dock” accessory for connecting the iPhone to an external display and keyboard (2), and one request each for better stock headphones, an external Webcam, a video-projector add-on, a TV tuner, and video-out functionality for everything (not just for videos and photos). Power: Not surprisingly, there were a number of votes for a better battery (7) and a replaceable battery (2). Other requests include wireless recharging (5) and an Apple-branded external battery pack (1). Storage: Eight people want a memory-card slot for additional storage. Also requested: an adapter for connecting flash/thumb drives (1) and an iPhone dock with USB and FireWire ports and a memory-card slot (1). Connectivity: Two people evidently feel their iPhone's wireless connection is a bottleneck, requesting 802.11n wireless; other responses were an infrared emitter for using the iPhone as a universal remote control (2), and one vote each for CDMA support, an Ethernet dock, a MIDI interface, more medical-device interfaces, and an ADB port. Yes, an ADB port. Construction: Two people want a “tougher” design that can take more abuse; other requests include a metal back, a non-glossy back, a grippy finish, an oleophobic body, and colors. Additional Buttons: We almost filed the number-one response here under "Camera Improvements": four people want physical buttons for the camera (4). Two others want hardware buttons for toggling WiFi or other settings. Notification Hardware: All five respondents in this category want an LED for notifications, much like the blinking light on a BlackBerry. Screen: Two people are hoping for an iPod with a larger screen; one other thinks Apple should switch the iPhone to an OLED screen. GPS Functionality: Two respondents are anxious for TomTom’s upcoming iPhone accessory/app combo for turn-by-turn driving directions. Printing: Both respondents here are hoping for a printer that works with the iPhone—a request that will also require software support. Miscellaneous: Two requests didn’t fit anywhere else: a built-in LED flashlight, and an accessory for making calls through your car’s radio that doesn’t use Bluetooth. 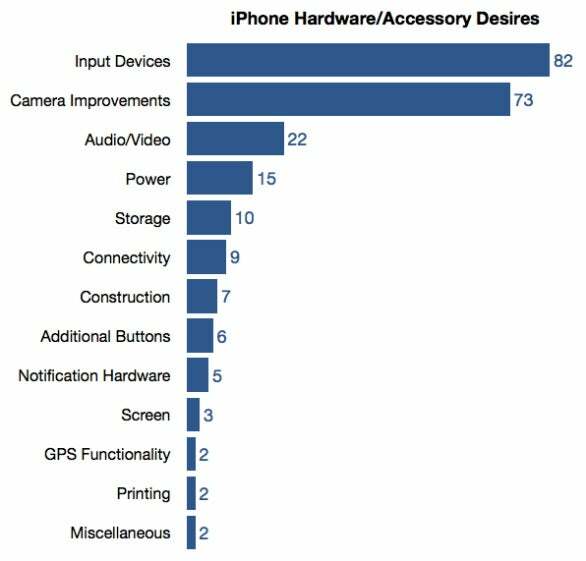 I wasn’t too surprised that an external keyboard was the number-one request overall; heck, several macworld editors are hoping for just such an accessory. But I was shocked by how many people want a front-facing camera for video chats. The good news for them is that it looks like Apple already has a patent on a front-facing iPhone camera; maybe we’ll see that feature in the next iPhone model. We’ve had so much fun with our Twitter surveys that there’s a good chance we’ll be doing them again (and we may even have more Macworld schwag to give away to respondents). So be sure to follow @macworld on Twitter to participate.